This verse tells us all we have with our God. 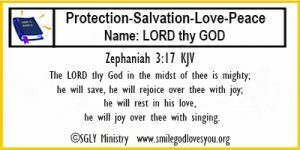 We have protection, salvation, love and peace. It tells us that God rejoices over us, even sings with joy over us! As you memorize this verse this week, I hope it will show you just how much God loves you and how important you are to Him! Well, can you believe it! This is our last week of A to Z Book by Book Memory Verses! Congratulations to all of you who have been with us week by week! You can be rejoicing in that you have many scriptures memorized that will be a very valuable resource to you for the rest of your life. And, what a wonderful verse we have to memorize as we come into the last week of this series. Our next memorization series will be announced soon. But, please let us know your thoughts on this memory verse series. We always appreciate hearing from you.